Scented candles with customized personal labels. Upload any label, photo or printable file. There is nothing on these candles that you cannot customize. 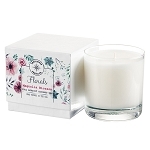 Choose your glass color, the wax color, the fragrance and box color than upload your personalized file that will be professionally printed and adhered to not only the candle jar but to the box you selected. The professional label we print have no restrictions, any amount of colors and any shape, we contour cut labels to any shape with no additional fees. 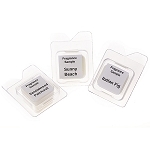 You can select the label media that fits your design best: gloss white, matte white, crystal clear or shiny silver. The more that are ordered the more you save. Great candles for gifts, wedding favors, baby shower favors, corporate gifts or for that personal touch in your own home.